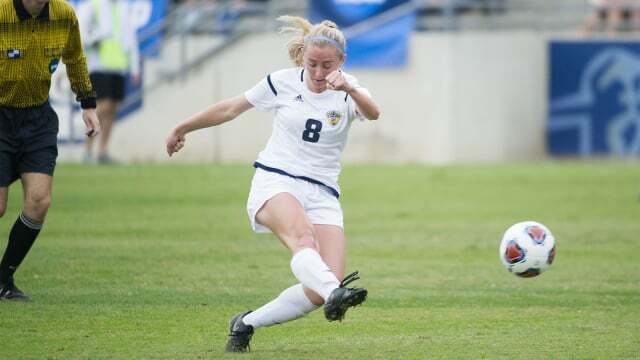 On Sunday afternoon, the UC San Diego women’s soccer team faced Concordia University-Portland in the second round of the NCAA Division II Women’s Championships, in what the Tritons hoped would be the beginning of their tournament run. It was just that, as the Tritons came out on top,2–1, and moved on to the third round of the West Region final. The first half was an even matchup between the two sides as both teams attempted to get an edge on their opponents. UCSD came close to scoring in the opening minutes as junior forward Mary Reilly carved through the defense with ease and gave herself a one-on-one opportunity against the goalkeeper; however, she pulled her low, left-footed shot wide right. Reilly’s chance was the clearest goal scoring opportunity both teams would have in the first half. Throughout the half, the Tritons looked sharp in their passing and especially on the defensive end as they kept their composure all afternoon. Concordia looked most dangerous in counter attacking opportunities, however the Tritons were brilliant, putting a halt to any real threat from Concordia. At the end of the half, Concordia held the shot advantage with its 10 shots to UCSD’s nine. The only real downside to UCSD’s first half was the fact that senior midfielder Elisa Martinez came out the match midway through the half with an injury. Unfortunately, this added to the Tritons injury list: They started the day with four starters out injured for the matchup. Even without one of their creative midfielders, the Tritons did not let up and got out to a dream start in the second half, netting two goals within the first ten minutes of the half. In the 54th minute, Reilly received the ball a few yards in front of the 18-yard box, turned on the defender and, while going away from goal, wrapped her right foot around the ball and let out a brilliant strike across the goal to give the Tritons the 1–0 advantage. Then, only 40 seconds later in the 55th minute, junior midfielder Summer Bales received the ball out wide on the left side and sent a wonderful cross into the box, where it was met by the head of senior Katie O’Laughlin to take a 2–0 advantage. After the Tritons widened their gap, the Cavaliers knew they had to become attack-minded if they were to get back into the game. Immediately, the match opened up and both sides went back and forth in attempting to create chances. Again, the UCSD defense consistently contained Concordia’s attack, but in the 80th, Concordia had a glimpse of hope as it was able to get a goal back with a low finish. For the remainder of the 10 minutes, the Tritons defended strongly and soaked up all the attack to get the victory and move on to the next round. With the victory UCSD coach, Brian McManus earned his 500th win in his 31st season with the Tritons, a remarkable feat no matter how you look at it. Now, McManus will hope to earn his 501st win on Friday night, when UCSD will look to come out on top in the West Region final (third round). UCSD will host defending National Champion Western Washington on Friday, Nov. 17th with kickoff at 7 p.m.